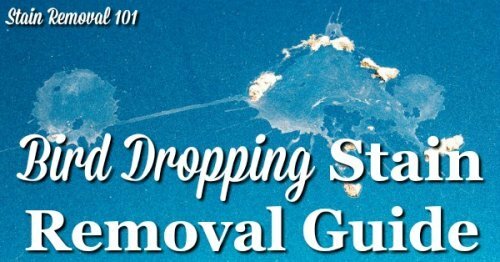 Bird Dropping Stain Removal Guide: What To Do After You Say Yuck! What To Do After You Say Yuck! 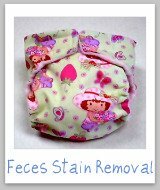 Bird dropping stain removal is not something anyone wants to have to think about. Trust me, I considered whether to actually write this page or not, because I really don't like to talk about it either -- but it happens, to almost everyone at one time or another. Also trust me when I say that once it happens to you, you want to know how to clean up, and remove those nasty droppings quickly, and effectively. 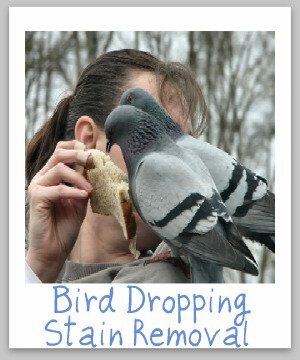 The problem with bird droppings from a stain removal standpoint is that sometimes those pesky birds have eaten berries, which means that they stain, big time. 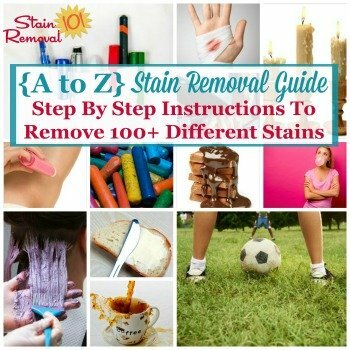 If you are having trouble removing the stains caused by these bird droppings using the step by step instructions below, I would also suggest looking at the A-Z Stain Removal Guide for berry stains removal, to get out the colored part of the stain. 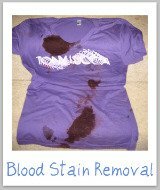 You may also want to check out these home remedies for removing berry stains from clothing, which may be of use to you. Step 1: Scrape off excess bird dropping from the fabric, being careful not to spread the stain further. Hint: Normally I suggest the dull side of a knife for scraping, but in this instance a plastic knife or spoon may be a better bet. Step 2: Run the fabric, inside out, under the cool water to flush out as much of the bird droppings as possible. 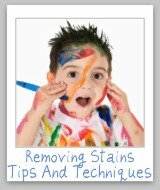 Step 3: Pretreat the stain with a paste of powdered laundry detergent (that contains enzymes) mixed with a little water, or with liquid laundry detergent (also containing enzymes). Step 5: If there is still a spot or mark left it is most likely the ingredients from within the droppings that have caused the problem. Apply hydrogen peroxide (or oxygen bleach in paste form) to the bird dropping stain, if safe for the fabric. Let sit for a few minutes and then rinse well. Step 6: Follow step 4 again by laundering the clothing or other fabric again, to complete the bird dropping stain removal process. Hint: Do not dry the fabric in the dryer until the spot is completely removed, or you may set it. 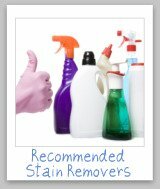 You may also want to review this video about removing bird dropping stains from clothing. Additional hint: I suggest also cleaning and disinfecting your washing machine after you wash clothing that had bird droppings on it. Click the link for instructions for this process. Step 1: Scrape off any excess bird droppings from the upholstery. The same hint as above applies, for use of the tools in the scraping off process. 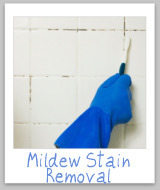 Step 3: Using this solution, sponge the stain from the bird droppings with a clean white cloth. 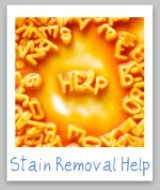 Hint: If this bird dropping stain removal process did not get the stain completely out go on to step 8 listed below. Step 7: Now that the stain from the bird droppings is removed you should get plain cold water and a new white cloth and sponge the area to remove the cleaning solution, and then blot dry. Hint: Be sure to get the upholstery only as wet as necessary for bird dropping stain removal. 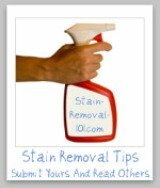 If the stain has been removed, you do not need to continue on to step 8 below. Step 8: Apply hydrogen peroxide with an eye dropper to the stained area. Let it sit for a few minutes and then rinse well. Hint: Whenever you use hydrogen peroxide on upholstery, first test this stain removal solution on the upholstery in an inconspicuous area to make sure it does not harm your upholstery. The instructions for bird dropping stain removal from carpet is the same as for upholstery. 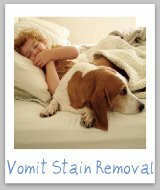 However, if you don't have luck with the stain removal methods above you can also do something additional with the carpet stain, which is to mix a solution of one tablespoon of ammonia with two cups warm water, and use this as a stain removal solution. Check out this advice for getting your car clean when it has been egged, which is also applicable to getting bird droppings off of your car. Click here for instructions for removing bird droppings from hard surfaces, such as patio furniture, hot tub covers, and other outside hard surfaces using a pressure washer. Further, here are general instructions for how to clean outdoor furniture, since if there's bird droppings on the furniture, it's most likely dirty in general as well.